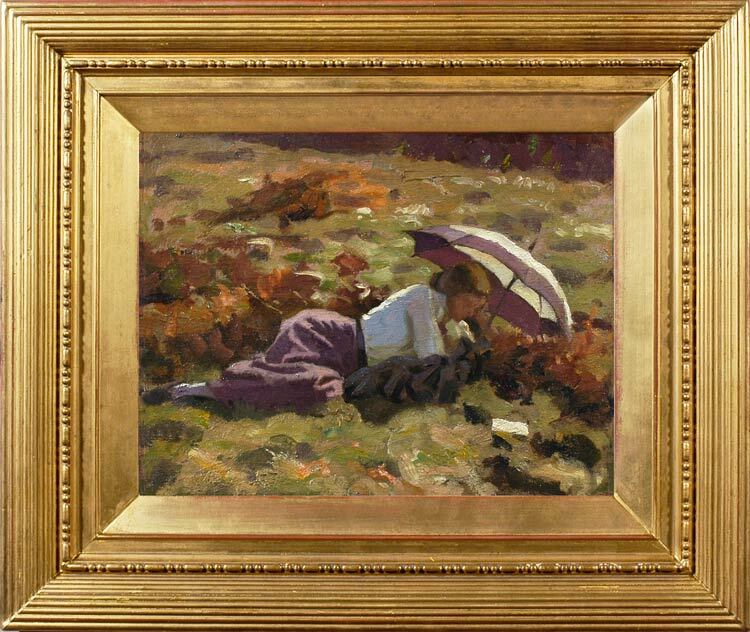 This sketch of his young wife reading under a parasol is less finished, more painterly than Burleigh’s ‘public’ works; it records an impression – an intimate moment in the sunny years before the First World War; possibly when Averil was pregnant with their first child (Veronica was born in 1909). It is perfectly composed, with a striking harmony of colour carried throughout the painting, and is notable for its beautifully-observed apprehension of light and shade. The succulent use of paint applied with a large brush gives a strongly realistic texture to the scrub and heather on which the figure lies, and there is a poignant sense both of immediacy and transience in the whole. Little is known of Charles Burleigh; he was born in Brighton in 1869, the third and only son of four children. His parents seem to have kept a small private school for 30 boys from 6 to 15, which Charles Burleigh probably also attended. He trained at Brighton School of Art, and then in Paris, under Jacques-Emile Blanche; this appears to be the only period of his life when he lived elsewhere than in Brighton or Hove. The censuses record that he was still living at home with his elderly parents at the age of 22, but by 1901, when he was 33, he was boarding in Shoreham, Hove. Between this census and the next, in 1911, he had married Averil Dell, also an artist, of Hassocks in Sussex, and they were living together in Hove. Charles was 15 years older than his wife, and may possibly have met her at Brighton School of Art, if – as is probable – he supplemented his income by teaching there. Apparently they may have married rapidly and early, when Averil was 20 or 22, since planning permission for a family house in Hove was granted in 1903, and built in 1905 (see the item on the history of Burleigh’s painting of his family in the Geffrye Museum). It contained a purpose-built studio for husband and wife to share, and Charles painted his wife – also painting – in the huge bay window in 1940 (Brighton Museums & Art Galleries). He is known for his depictions of interiors, including those in public places – such as two more belonging to Brighton Museums & Art Galleries, which show the Music Room of Brighton Pavilion and the Dome in use as military hospitals during the First World War. He was also a landscapist and a painter of urban scenes. Charles Burleigh was elected to the Royal Institute of Oil Painters (ROI) and the Royal Institute of Painters in Watercolours (RI). He exhibited both at the exhibitions of these institutions, and at the Royal Academy and the Fine Art Society. His wife, Averil, also exhibited at the RA and the ROI, under the name of Averil Burleigh, as did his daughter, Veronica (b.1909). His son, Duncan, unfortunately developed an unnamed illness at the age of 18, and Averil Burleigh became seriously ill in the late 1940s. The Burleigh family taking tea in a room overlooking a garden at Wilbury Crescent, Hove, c.1947 (Geffrye Museum), although superficially a sunlit scene of domestic intimacy, records this sombre aspect to their lives; two years later Averil was dead. Works in public collections include: Brighton Front, c.1920, Portrait of an organist, 1921, The Music Room of the Royal Pavilion, c.1923-4, Brighton Arts Club, c.1930, Lieut. Col. S. Moens, Portrait of an old man (all Brighton Museums & Art Galleries); plus works in The Slade & UCL, London, and in other provincial art galleries.